Have an opinion on the proposed cable park at Nichols Basin Hood River? Let the Port know, tonight Sept. 12 at 5 pm. Hood River Inn, Columbia Room. Well done all! Definately appeared as if the opposition dominated the forum. Yah, there were a lot of people with a lot of things to say. I have stated from the start: there is only one valid and legitimate concern: displacement of current users. My posts here will show that I have acknowledged that from the very start, and I think it's a reasonable discussion that must be had. I support paddlesports. I own *four* standup boards myself. I tried to start a flippin' SUP magazine. If the Friends of Hood River combined all their hours on a SUP board together, they might have a chance at catching up with the amount paddling I've done over the last five years. Which is why I feel like I'm fairly qualified to say this: There's practical and reasonable ways of making sure everyone gets their water space. But the Friends of Hood River continue to throw gasoline on a fire with threats of lawsuits and continued harassment. You want a better waterfront? So do we. We're willing to talk about it and work together. The FoHRW aren't. Their stance is hard: "This is all mine, and you're not going to take it!". It isn't all yours, and the purported plan shares the boat basin. People with vested business interests like Dave Nunn have stated that peaceful co-existence is totally reasonable. The opposition continues to refuse to discuss any pragmatic everybody-gets-to-play solution that utilizes the broad waterfront we have at our disposal. And yet, they still insist on calling the people supporting a cable park and a more diverse set of water users the exclusionary ones. The public use doctrine also fails to acknowledge a pretty obvious point: there's nothing about the cable that's exclusionary to *people*. It IS a public use of the boat basin. Just like marinas, or designated swimming areas, or windsurfing or kiteboarding beaches. It's just not the one that the FoHRW want, so they're screaming "EXCLUSIONARY! PUBLIC USE DOCTRINE!" Yes, it costs money. So does purchasing a kayak, SUP board, or boat. They keep accusing us of being greedy, and tell us we can't play in the basin because they want it for themselves. The biggest bummer? Even if the FoHRW succeed, all that amplified use of the boat basin that we've seen this summer (and even then, it's not much!) is going to dwindle back down to next-to-nothing. The few left over, the it's-mine-and-you-can't-have-it crowd will sit smugly in their kayaks and think they're community heros, when all they've really done is destroy a chance for our community to have a fun, unique, healthy activity that sets it apart from all those other "Best River Towns in the US". You guys can this thing, and we're going to be looking at Lot 1 and the current basin set up for the next ten years while the port struggles to find a developer willing to wade into this wasp's nest. The port knows the Cable Park is a reasonable, fun, safe fit for the community that makes use of a difficult-to-commodify piece of propert, and that our community will benefit from it as a whole. The bummer about this is that the Port has all the facts, but they can't weigh the mere facts. They're going to have to weigh the cost of dealing with the fall-out from a group of people who have nothing better to do than assert why a small piece of water should belong to no one but them. This is close-minded NIMBYism defined. It's disgusting. Thanks for your thoughts Josh. You're coming through loud and clear. Josh, you may be disgusted, but some of your comments make me confused. Are you saying that windsurfing "beaches" exclude other users? Firstly, I am unaware of any beaches that are exclusively for windsurfing. Secondly, on a windy day a swimmer, a kayaker, a fisherperson, a stand up paddler, a windsurfer, or any other person who wants to access the water from the beach where I am windsurfing is free to do so and access the entirety of the navigable waters of the Columbia. I do not believe this is true of the Boat Basin if the cable park is permitted. Would not users, other than those using the cable park be excluded from some of the navigable waters for certain periods of time? I think when you refer to the Public Use Doctrine you may be referring to the Public Trust Doctrine. 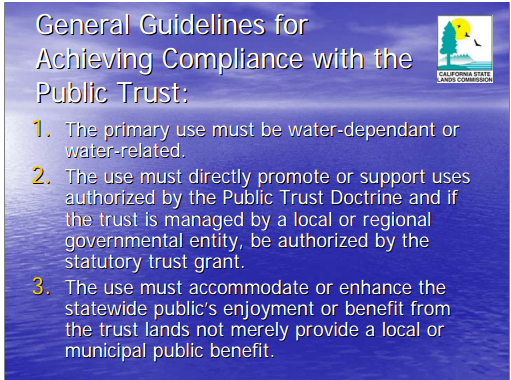 Typically, the Public Trust Doctrine permits private use of public water for navigation and commerce which benefits all of the citizens. I sincerely hope you are able to overcome your disgust and befuddlement. Actually, the Public Trust Law and the Public use law (aka the floatage easement) are separate, but related laws. 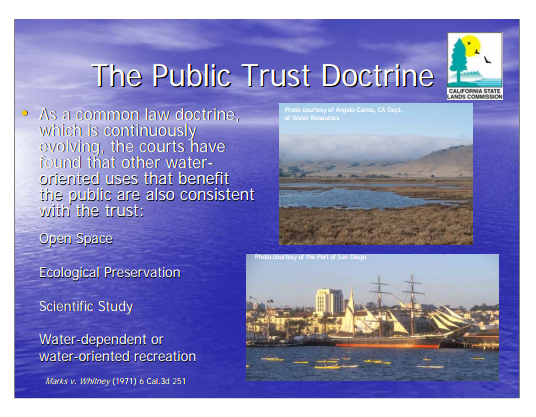 The former (Public Trust law) is a federal law that holds ownership (title) to the submerged and submersible lands, as well as the waters, in trust for the public. Title was turned over to the State of Oregon at the time of statehood in 1859. The Public Use law is an Orgeon State Common law that has nothing to do with the submersible lands underneath the water. It provides the public with an easement for the use of navigable waterways over privately owned (titled)submerged lands. Think of it as an easement over a privately owned road for public use. If you are the landowner, you can not restrict, block off or prevent passage over the road on which there is a public easement. Assuming the Port of Hood River owns the submerged land in the Nichols Boat Basin, the public has an easement to float boats, swim and fish in the waters of the basin. Those rights are guaranteed by Oregon State's Public Use Common Law. These two laws together (the Public Trust and the Public Use laws) are what allow us to walk on the beaches at the coast below the high water mark, swim and surf in the ocean in front of someone else's house, windsurf, kite, swim, canoe, kayak or float over and fish in rivers and streams in Oregon over the submerged land that may be owned by an adjacent landowner. We should all be thankful for the foresight of the lawmakers who provided these public protections for use of Oregon waterways. So, Mr. Sampiero, if you disgusted and don't like the fact that people are unyielding in their efforts to protect their rights to use the public easement in the boat basin, you should try to change the law. Good luck with that. I agree with jsampiros views. I'm not sure the opponents arguments about public trust and public use are relevant in this case although I do appreciate the fundamental right of the public to be able to navigate our beautiful waterways. This project will not stop anyone from transiting up and down the Columbia river, just one small backwater man-made harbor. This section of Oregon law may be more applicable, especially item 3 notice "tramways, cableways", but I'm not an attorney! (1) Establish, operate and maintain water transportation lines in any of the navigable waters of this state and waters tributary thereto, any portion of which may touch the boundaries of the port. (2) Engage generally in the business of buying and selling coal, fuel oil and all kinds of fuel for watercraft of all kinds. (3) Acquire, construct, maintain or operate sea walls, jetties, piers, wharves, docks, boat landings, warehouses, storehouses, elevators, grain bins, terminal icing plants, facilities for processing agricultural, fish or meat products, bunkers, oil tanks, ferries, canals, locks, tidal basins, bridges, subways, tramways, cableways, conveyors, power plants, power transmission lines, administration buildings and fishing terminals, and modern appliances and buildings for the economical handling, packing, storing and transportation of freight and handling of passenger traffic with full power to lease and sell the same, together with the lands upon which they are situated, whether held by the port in its governmental capacity or not. (4) For the public convenience and the convenience of its shipping and commercial interests, may improve all or any portion of the waterfront of its harbors, rivers and waterways. (5) Enlarge its tidal area, and construct, excavate or dredge canals and channels connecting its waterways with one another or with other waterways and the sea. Public use doctrine does not differentiate between man made or natural riverbank geography if it is in a public river. It makes no difference. The basin is considered the Columbia river and qualifies for its same protections. The difference between a cable park and what the you sited as is that all those exceptions are for commerce that acts for the greater good of the public. The commerce that surrounds rivers throughout history have been protected that way. A Cable park does not qualify as it is an amusement park ride according to Oregon state law and not specifically designated commerce for the great good of the public. That is a very important distinction when considering public use doctrine. Don't check iWindsurf forums directly before going to bed. Youwindsurf: My admittedly poorly articulated point is that while we designate certain beaches and make them friendly for certain activities, We also designate that some other activities can't happen at certain beaches - like kiteboarding at the marina, or windsurfing from the new waterfront park. Those areas are designated for swimming. Why is it unreasonable to designate an area for wakeboarding? Like swimming, it's an activity that many people like to participate in. Like it's not great for kiters to be around swimmers (swimmers have rights, don't they? ), it's not great for other water users to be around wakeboarders (wakeboarders have rights, don't they?). In regards to your link to the Public Trust compliance requirements for California - as always with the law, it's about interpretation. It wouldn't take much of a lawyer to establish a sound argument that the cable park would meet the requirements for public trust. See attached screenshots - the cable park allows recreational use of the water, and it's got to do as much for the greater good of the state as a buncha people paddling that water does. Hell, it's harder to argue that the cable park DOESN'T meet the Public Trust requirements. Phazle: What disgust me is that you think you have an exclusive right to use the boat basin in only ways that you want to, and if I want to use it in a different way, I can't do that. In principle, you would have to admit that were I to be cable wakeboarding in the basin using an on-the-land winch, with no barrier, and I were just to wakeboard around the SUPers using that area, they would have no legal recourse to prevent me from doing that. It is already legal, right now. So if that area is roped off for everyone's safety, why is that suddenly illegal? This is one small area roped off for safety for a specific activity. You guys have the rest of the freaking gorge. CUSailin: I've seen you the last few times I've been at Rowena. In between here and there, there are nearly half a dozen many places to paddle, fish and swim. Am I lying? The boat launch west of Rowena opens up into a gorgeous natural habitat. Two saturdays ago we paddled there, and even though it was blowing 20+ on the river that day, it was much glassier than the boat basin would have been. There's acres and acres of paddling area. Way more than the boat basin. I'd even buy the argument that the cable park's towers would look out of place there. But next to the freeway and the gas station? Come on. There's Koberg. The beach by Hood River Inn. Bingen. The hook. The marina. There is one spot that's suitable for a cable park. One. I do not understand how a community of people can clutch so tightly to a few small acres that they never touched before this conversation happened. I made a very conscious decision not to become a lawyer, but I am a fairly logical human being, and I have no qualms in asserting this: No matter what your interpretation of the Public Trust Doctrine, the spirit of it is based on a simple principle: What's going to do the most good for the most people. Derek, since you're becoming quite the legal scholar, I hope you can wrap your head around that idea. The Public Trust doctrine isn't there to stall progress at any cost - it's to ensure that progress is made with the greater good in mind. And since I know this is going to be a tough concept for you to understand: just because the state has decided the cable park would be governed by amusement park regulations doesn't make it a rollercoaster, and *even if it were* a rollercoaster, that's not to say it couldn't improve the quality of life. It's about what the spirit or intent accomplishes, not what the regulations governing it are. Even with the over-blown claims by the FoHRW about the prior use of the boat basin, there is no way the cable park fails to A)increase the diversity of watersports currently practiced in our area. B)Increase the net number of people participating in watersports in Hood River, with significant increases to local youth and needed out-of-town dollars. Maybe I'm one of those assholes who likes "progress", but I see those as good things. Still, not an iota of give from the FoHRW. I've suggested on numerous occasions that we sit down together, and find some positive ways to improve paddle/swim access in other parts of the waterfront in close proximity to town. But you guys aren't interested in the greater good of the community. You just want to keep fueling the flames on this fire. I have stated from the start: there is only one valid and legitimate concern: displacement of current users. What gives any one citizen the authority to dismiss others' concerns about such factors as visual impact, crowds, amusement park mentality, disparity in the application of Scenic Area rules, restoration if the cable park fails, etc?